I always see products about making you slimmer and doing all of these wonderful things to your body and thought it was all pretty much rubbish. But after using Nip + Fab products I can actually say these products work! Okay I am not meaning you are going to drop a dress size just from using a body moisturiser but you can really feel and see change. I've been using the Body Slim Fix for about a month now - and as you can see I have pretty much finished the bottle. It directs you to use it morning and night, I however tended to use it just in the evening after having a bath. I used it on the areas of my body that I wanted a little help on so I would put it on my thighs/bottom, tummy and arms. To begin with I didn't really notice any difference but it smells nice and was a nice part of my evening routine. After about three weeks I could feel that the back of my thighs were pretty tight and I was so shocked on how quick it happened. I haven't been using the Bee Sting product for as long but can tell it is doing a similar thing but isn't as focused on creating the same outcome as the Body Slim Fix. It is however a lovely cream to put on and treat your skin! I really can't wait to try some more Nip + Fab products from the other collections they have! 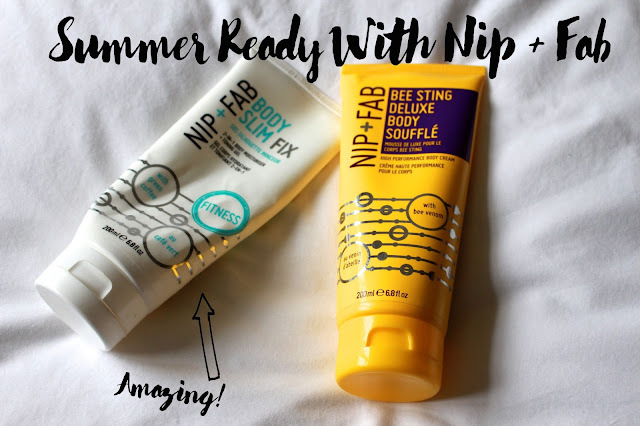 What do you think of Nip + Fab products?